It has been over a month since Star Wars: The Force Awakens flew into theaters, and ever since we were lucky enough to see a screening, fans have been eagerly anticipating owning their own copy of Episode VII. The ability to watch Finn, Rey, and Kylo Ren at anytime of the day is an exciting concept, especially with the promise of deleted scenes in the film’s special features. Well fear no more rebels, because it seems that we finally have a date for when the galaxy won’t be as far, far away anymore. Amazon is showing that the Blu-Ray version of The Force Awakens will be available on April 5th, 2016. Cue the Hallelujah chorus sung by Ewoks. While Amazon has not yet listed when the digital release, which is usually a few weeks before the hard copy, will be, both version of The Force Awakens are available to pre-order. Up until now, diehard fans of Star Wars had to shell out extra bucks and go to the movie theater multiple times in order to truly see every nuanced moment from The Force Awakens. And honestly, who can blame them? News regarding easter eggs and cameos have only continued to be released throughout the month, so in order to truly enjoy all the fan moments peppered in during the movie you’d have to return to the cinema and sit through the space opera all over again. Since The Force Awakens is such a fast paced and action filled adventure, so many of the easter egg moments fly by without the audience being any the wiser. When we finally get the Blu-Ray version, we’ll be able to pause and rewind moments like Kevin Smith’s one-liner and Ewan McGregor’s moment in Rey’s Jedi vision. I wouldn’t be surprised if J.J. Abrams compiled a list of the easter eggs to accompany the DVD and Blu-Ray version, so we could play along Rocky Horror style. Perhaps the most exciting prospect from The Force Awakens’ forthcoming DVD release is the deleted scenes that will surely be present. While J.J. Abrams has already confirmed that we won’t be given an extended cut of the film, we will surely be treated to some scenes that were cut out of Episode VII. Is there more footage of Luke that we didn’t get to see? Since he voiced over the original trailer, perhaps there is more to the character than what we saw in theaters. Personally, I’m dying to see some of the lost footage of Maz Kanta, especially the scene where she apparently uses force powers to protect herself from First Order Stormtroopers. I felt like Maz was a terrific new addition to the Star Wars universe, and one I’d like to see more of. Her long life and knowledge of the force is intriguing, and a tabloid earlier stated that a bunch of Maz’s scenes ended up being cut from the theatrical version of The Force Awakens. 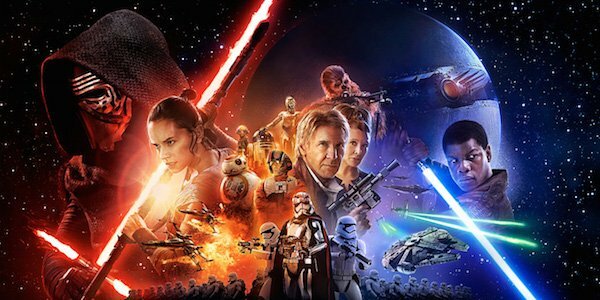 The Force Awakens will arrive in Blu-Ray on April 5th. We’ll keep you updated regarding special features as they become public.